The inventors at Animaland are at it again. They've been busy in the toy shop creating new stuffed animals just for you. Spend some time exploring their latest plush creations. You're sure to discover a new friend you'll want to bring home. Animaland is in the interactive stuffing industry focusing on impulse sales in a store-within-a-store environment. The Company is a supplier and global manufacturer of "stuff-it-yourself" plush animals, outfits, accessories, and stuffing machines to resellers and distributors domestically and internationally. According to Unity Marketing's Plush Report, one in five American households purchased a stuffed toy in 2002. Moreover, the average child has a dozen or more stuffed animals. 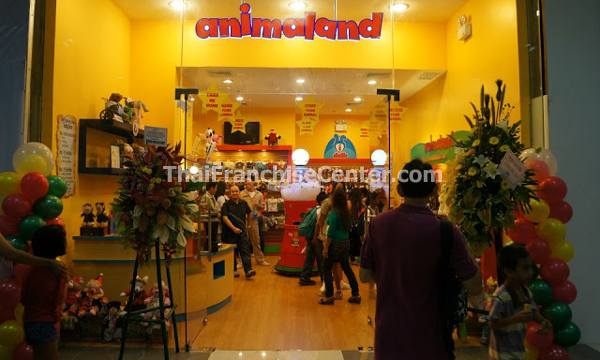 Animaland provides an interactive buying experience by providing unstuffed, plush animals, stuffing material, and stuffing machines to resellers and distributors for sales at a variety of public and private venues. Children, both pre-teens and teens, experience the animal they've selected come to life as they fill it with stuffing material by pressing on the foot pedal of a stuffing machine. The child then makes a wish on a 'wishing star', which they place inside their new best friend. A sound chip containing a pre-recorded animal sound or a customizable personal recorded greeting may also be inserted into the stuffed animal before it is permanently closed. The child may also customize their new best friend by dressing the stuffed animal with an outfit or accessories, such as shoes or sunglasses, from more than three hundred available items. Each animal also comes with a birth certificate, which has a place to list the animal's name, date and place of birth, species, height, weight, eye and fur color, and its pedigree number. On the surface Animaland locations appear to be selling plush toys to children. What Animaland is really providing to children is an interactive experience. The outcome is a stronger connection between the child and their new plush toy, which they just “brought to life”, as compared to buying an ordinary plush animal, which could be purchased anywhere, and put on the shelf with the rest of their plush animal collection. The animals are limited editions and individually serial numbered with a unique registration number. Animals have been retired from time to time, after which they are no longer produced.